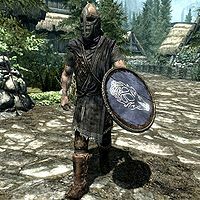 Falkreath Guards are guards who act as the military and police force of Falkreath. These guards serve under Jarl Siddgeir. Should the Stormcloak forces gain control of Falkreath, they will be replaced by Stormcloak guards under the service of Jarl Dengeir. Falkreath guards are clad in a set of Falkreath guard's equipment. This includes a Falkreath guard's armor, a Falkreath guard's helmet, and a Falkreath guard's shield. They also wear a pair of fur boots. They are equipped with an Imperial sword and an Imperial bow supplemented with 20 steel arrows. They also carry a steel dagger, a 50% chance of a torch, and a variety of leveled loot and gold. This page was last modified on 26 November 2016, at 04:21.